Rat Trap társasjáték - Magyarország társasjáték keresője! A társasjáték érték! A Rat Trap egy nagyszerű társasjáték, 3 - 5 játékos részére, az átlagos játékidő rövid, csak 15 - 30 perc. A társast, 8 éves kortól ajánljuk kipróbálni. A játékmenet erősen épít a váltakozó képességek, a szövetségek, a kockadobás és a merj és nyerj mechanizmusokra. 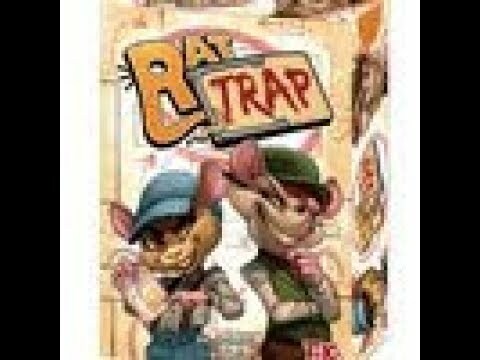 In Rat Trap, players make up a rat-pack of burglars who work together to try to score as much cheese as possible while avoiding both traps and cat attacks — but can you really trust your partners in crime? To set up, decks of cards are placed face down on the table, with these decks representing locations that the rats try to search (by drawing from them during the round). You want to find cheese in these decks, but you must also avoid the traps they contain. When it's your turn, you must roll two dice (or in the advanced rules four dice). The dice represent the actions available for this turn: draw cards, steal cards, send the cat to eliminate the competition, heal yourself, etc. Unfortunately, you may not use the dice you roll! You must choose one or two partners to whom you will give the dice. They decide which action they keep for themselves and which action they give back to you, so discuss and choose your partners carefully! 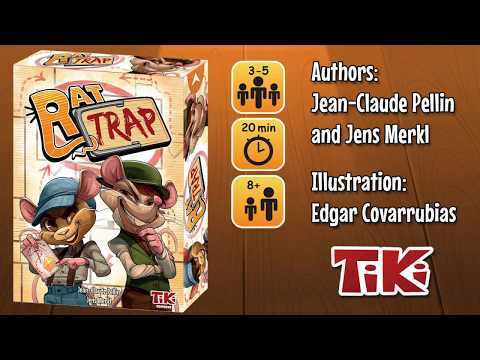 Rat Trap is a 15- to 25-minute family game that may also be played with gamers who want a quick and fun game with a bit of treachery in it. The game includes both basic rules and advanced rules, with the latter having more dice for more complicated choices and role cards that give you special abilities during the game. The game also includes a two-player variant.